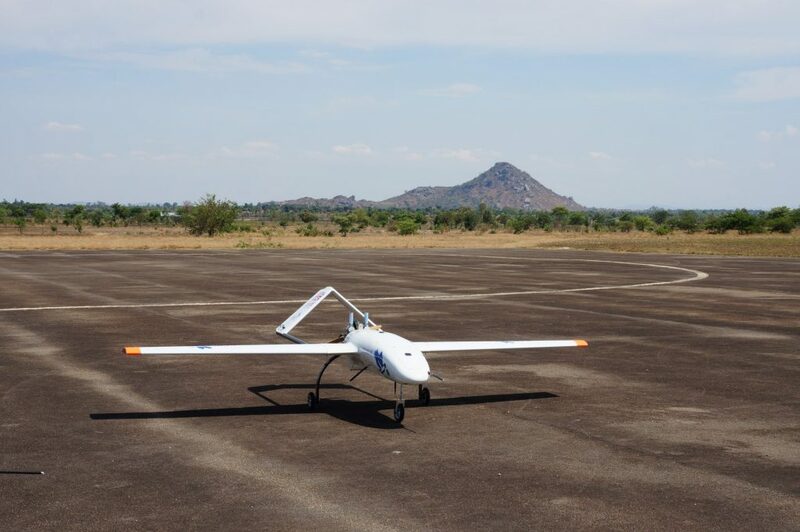 Routine operational deployments of the UAVAid Hansard system took a major step forward in November 2018 with a trial deployment in Malawi. The drone platform was deployed with a team of operators and engineers to the Kasungu Aerodrome, with the goal of further understanding and preparing for the practical constraints and issues related to operating long range multi role drones in remote areas, with limited backup infrastructure. With its high poverty rates, poor infrastructure and access approvals in place for the Kasungu drone corridor, Malawi was an ideal location for a ‘use case’ trial deployment. The team deployed to the aerodrome, together with the aircraft and support equipment necessary to complete a trial programme. The logistics fell into place with everything arriving on time and intact. The team established base in the Kasungu aerodrome building for use as indoor maintenance, aircraft control, local air traffic control and storage. The purpose of the programme to ‘dry run’ the practical aspects of deploying the equipment and teams into a use-case context, and learning from the experience as much as possible. We succeeded. 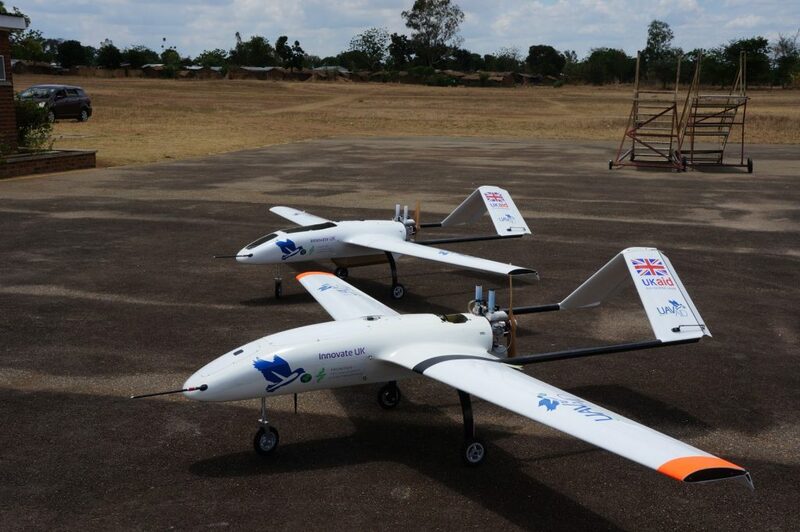 Since arrival in Malawi, the performance of the UAV engines was significantly below that of the pre-deployment tests of just two weeks prior. The Hansard UAV is designed to operate on internationally available, regular, road gasoline and gasoline/ethanol blends typical of that locally available in most parts of the developing world. The aerodrome was at approx 1000m elevation, well within the parameters of the drone’s capability of operating 3000m asl. Hansard V aircraft standing ready on the aerodrome apron. After several days of investigation on multiple UAV aircraft and engines, it was concluded that the most likely cause of the engine performance irregularity was that the fuels sourced from local service stations were detrimentally contaminated. To test the contamination hypothesis, a rudimentary in-the-field ‘burn test’ was conducted. 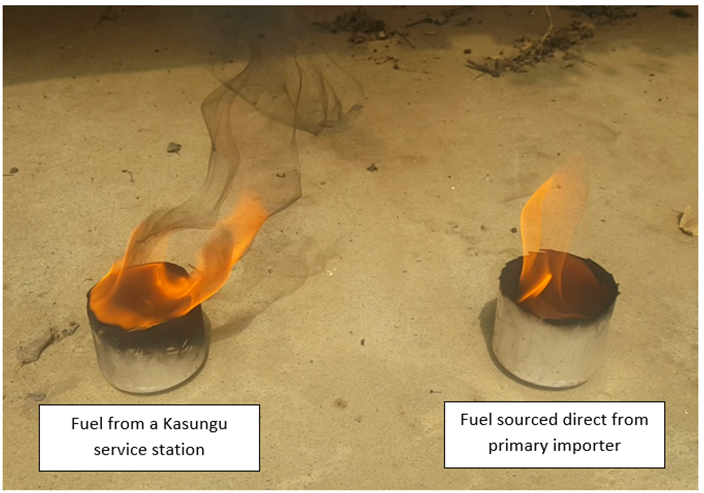 Equal quantities of 1) fuel sourced from multiple local automotive service stations in Kasungu District and 2) ‘clean’ gasoline directly sourced from the primary importer in Lilongwe, were put in small aluminium dishes and set alight, with the resultant burn observed. This was repeated. When compared to the relatively clean burn of the fuel from the national importer, the fuel sourced from local service stations burned with plumes of heavy black smoke, produced pungent and acrid smells, left considerable carbon deposits and in some cases a residual black ‘sludge’, indicating poor combustion and suggesting significant contamination with other unknown substances. UAVAid will be returning to Malawi. Legal Disclaimer: The authors have documented their own experiences only. It should be noted that the test methodology of the burn test was not robust and further investigation is strongly recommended before any conclusions are drawn.